Leopold Mozart was only too aware of the potential advantages of traveling with his son, Wolfgang, to Italy. Even at the Salzburg court – which had long-standing ties with Italy in any case 22Because of its numerous churches, open squares and fountains, modeled on Roman architecture, Salzburg was sometimes called ‘the German Rome’; see Cliff Eisen, ‘Salzburg under Church Rule’ in Neal Zaslaw, ed., The Classical Era. From the 1740s to the end of the 18th century (Houndmills, Basingstoke, 1989), 166. More generally on musical relations between Salzburg and Italy, see Cliff Eisen, ‘Mozart e l'Italia: il Ruolo di Salisburgo,’ Rivista Italiana di Musicologia 30 (1995), 51-84. [close] – Italy was seen as a ‘finishing school’ for young musicians, singers in particular. In the 1750s and 1760s, several members of the Salzburg court music were sent to Italy to study, among them the bassoonist Franz Schwarzmann, the singers Joseph Meissner and Felix Winter, and the organist and composer Anton Cajetan Adlgasser. But Wolfgang’s case was not entirely the same: already an accomplished musician, his tours of Italy were intended not only to give him first-hand experience of Italian theatre (something not generally available to him in Salzburg) but also to win honours and fame even beyond those won during the earlier tours to Germany, France, Holland and England (1763-1766) and Vienna (1767-1768), chiefly through opera commissions, and possibly even a permanent appointment. In genuine ‘Grand Tour’ fashion, he also wanted to expose Mozart to Italy’s cultural wonders. This necessitated establishing contacts, making travel arrangements and courting a variety of musical and non-musical, chiefly noble, establishments throughout the peninsula, which was diverse in its political and cultural make-up and dispositions. 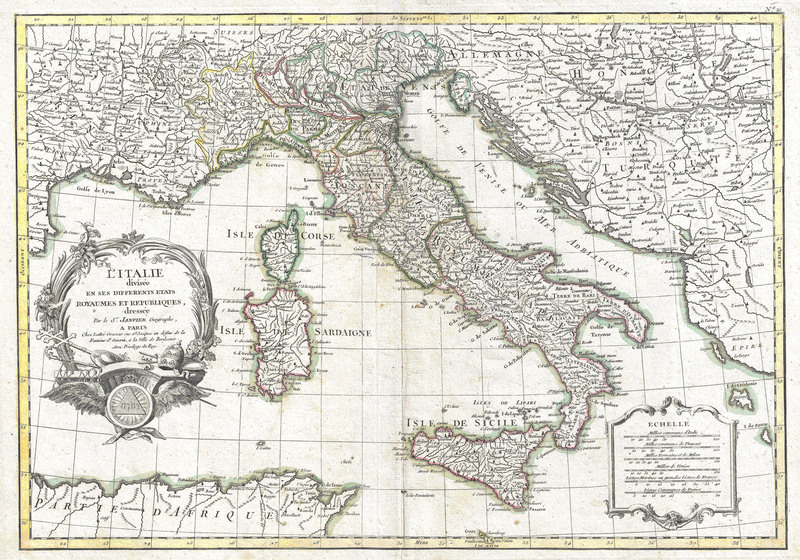 Italy in 1770 was a far cry from its earlier heyday: continental trade, previously centred on the Mediterranean, had by then shifted to the Atlantic; the Papal States had lost much of their former authority, partly as a result of the Protestant Reformation and partly because Catholic monarchs increasingly sought independence from Rome; Venice had stagnated after its struggles with the Ottoman Empire; Naples had suffered under, successively, Spanish, Austrian and then Spanish again, rule; and while the southern part of the peninsula consisted of large, bureaucratically homogenous political units (see figure 1) – chiefly the Papal States (ruled by the Pope, at the time Clement XIV) and the Kingdom of Naples (ruled by the Spanish Bourbons, at the time King Ferdinand IV) – the north, largely but not exclusively under Austrian control, was fragmented. It included the Prince-Bishoprics of Brixen and Trent, the Grand Duchy of Tuscany (the Habsburg-Lorraine family), the Duchy of Parma, Piacenza and Gustalla (the Bourbons of Parma), the Duchy of Modena and Reggio (the Este family), the Republic of Venice, and, most importantly perhaps, the Duchy of Milan (under direct Austrian control) (see figure 2). Local bureaucracies, customs, travel conditions and accommodations, cultural predilections and personal dispositions all had to be negotiated by Leopold, chiefly through a network of contacts that began in Salzburg and spread from there, sometimes second- or third-hand, throughout the peninsula. To give only one example: Franz Lactanz Firmian, Obersthofmeister in Salzburg and a supporter of the Mozarts, was the older brother of Karl Joseph Firmian, from 1759 Governor of Lombardy, and Wolfgang’s most important patron in Milan; Karl Joseph took it upon himself to write letters of recommendation for the Mozarts to, among others, Count Gian Luca Pallavicini-Centurioni of Bologna, who then wrote to his distant relation Cardinal Count Lazzaro Opizio Pallavicini in Rome. For his part, Cardinal Pallavicini wrote to his relation Field Marshall Giuseppe Maria Pallavicini in Bologna, who then wrote to Baron Matthäus Dominicus Saint-Odîle in Rome, who subsequently introduced the Mozarts to Giuseppe Bonechi, secretary to the imperial ambassador at Naples (see, for example, letters 165, 171, 176 and 177, among others). Similar networks were established through other prominent Salzburg families, include the Arcos. 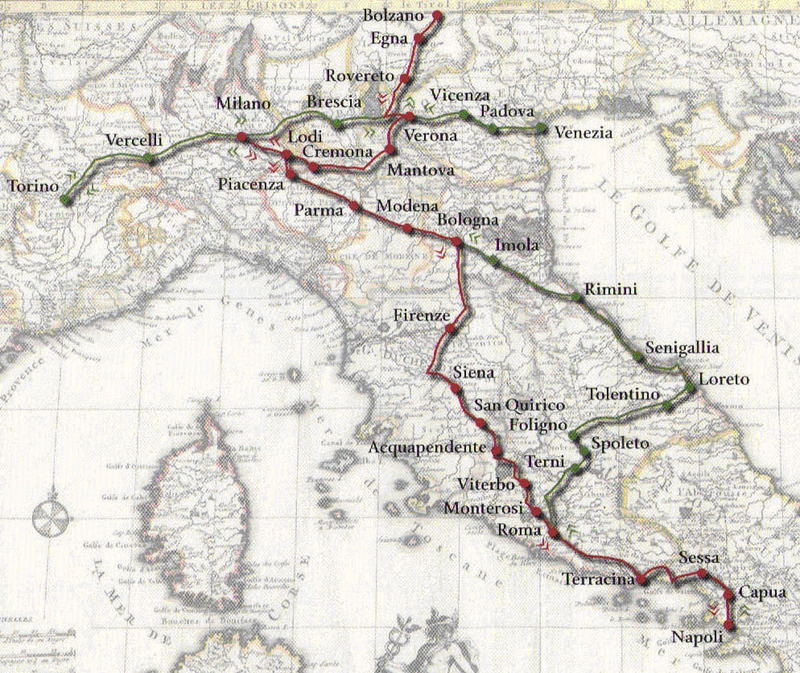 Mozart’s three Italian journeys (13 December 1769-28 March 1771, 13 August-15 December 1771, 24 October 1772-13 March 1773) all began with transit from Salzburg via St Johann in Tyrol, Wörgl, Schwaz, Innsbruck, Steinach, Sterzing, Brixen (Bressanone), Atzwang, Bozen (Bolzano) and Egna to Rovereto. 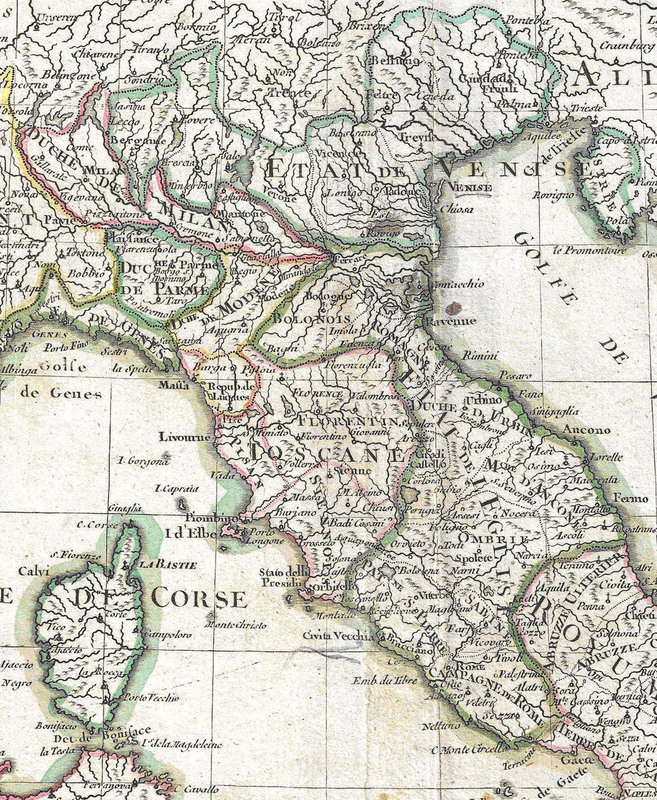 From there Mozart and his father traveled, on the first Italian trip, to Verona, Mantua, Bozzolo, Cremona, Milan, Lodi, Piacenza, Parma, Modena, Bologna, Florence, Siena, Orvieto, Viterbo, Rome, Marino, Sessa, Capua and Naples (with visits to Vesuvius, Pompeii, Herculaneum, Caserta and Capodimonte), before heading north again to Rome, Civita Castellana, Terni, Spoleto, Foligno, Loreto, Ancona, Senigallia, Pesaro, Rimini, Forlì, Imola, Bologna, Parma, Piacenza and Milan (where Mitridate, Re di Ponto premièred on 18 December 1770), then home by a somewhat circuitous route through Canonica, Brescia, Verona, Vicenza, Padua, Venice, Padua, Vicenza, Verona, Rovereto, Brixen and Innsbruck. 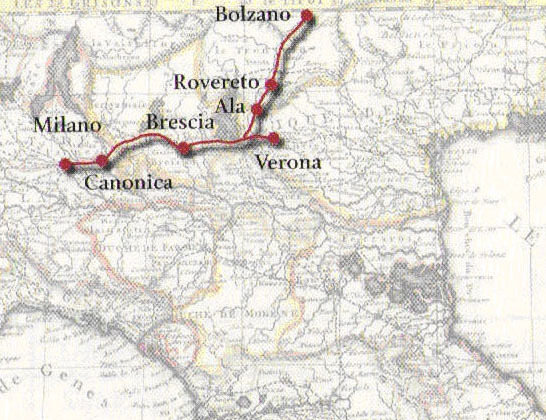 The second trip took them to Ala, Verona, Brescia, Canonica and Milan (for the première of Ascanio in alba on 17 October 1771), and the third chiefly to Milan (for the première of Lucio Silla on 26 December 1772) (see figures 3-4). It is possible, based on the family letters and other documents, to identify a number of composers and works heard or performed by Mozart in Italy, sometimes specifically, as in the case of operas, or more vaguely, in the case of instrumental music, chiefly because surviving concert programmes generally name only the type of work and rarely even the composer. For Mozart’s concert at the Teatro Scientifico, Mantua, on 16 January 1770, for example, we know only that the programme included ‘a concerto for harpsichord presented and performed by him at sight’, a ‘sonata for harpsichord performed at sight by the youth’, a ‘concerto for violin obbligato by a Professor’, a ‘concerto for oboe obbligato by a Professor’ and a ‘trio in which Sig. Amadeo will play an improvised violin part’ (see letter 157). A review of Mozart’s Verona concert on 5 January 1770 notes that the programme included a trio by Boccherini (see letter 152). As for church music, we know that Mozart heard Allegri’s Miserere while in Rome (see below) and that on 30 September 1770 he attended a grand ceremony at Bologna that included a mass and vespers written by ten different composers, among them Petronio Lanzi, Lorenzo Gibelli, Antonio Fontana, Callisto Zanotti, Gabriele Vignali), Giuseppe Carretti, Bernardino Ottani, and Antonio Mazzoni (see letter 206). Actual performance, or attendance at operas, was not the only way Mozart became acquainted with Italian music. During their time there, Leopold was given, or actively purchased, numerous works, some on behalf of the Salzburg court, 66In his letter of 23 January 1773 (letter 281), for example, Leopold writes: ‘. . . I hope that with God’s help I’ll be able to leave here during the first week of next month, assuming I’m not detained by the copyists working on the music that I’m having copied for H[is] Grace . . .’. [close] others for his, and Mozart’s, own private use. Wolfgang copied out Giorgio Allegri’s famous Miserere while in Rome (letters 176 and 184), and Leopold purchased copies of Francesco Antonio Bonporti’s Inventioni da camera op. 10 and the aria ‘Un pensier mi dice al core’ from Baldassare Galuppi’s L’amante di tutte. It may have been in Italy that Leopold made a copy of Eugène Ligniville’s Stabat Mater (K1 Anh. 238, K6 Anh. A17). Other pieces of music that cannot be shown to derive from the Mozarts but that survive in the same collection as other works once owned by the family, may similarly have been owned by them and purchased in Italy, including Rutini’s Sei sonate per cembalo published at Bologna in 1770, and the arias ‘Se possono tanto due luci vezzose’ and ‘Vedrai con tuo periglio’ by Antonio Saccini. 77See Cliff Eisen, ‘The Mozarts’ Salzburg Music Library’ in Cliff Eisen, ed., Mozart Studies 2 (Oxford, 1997), 83-138. [close] Similarly, it is certain that Mozart heard the overture to Josef Mysliveček’s Demoofonte, writing to his siter on 22 December 1770: ‘Ask whether or not they`ve got this symphony by Mysliveček in Salzburg, because if they haven`t, we`ll bring it with us’ (letter 224). Finally, the Mozarts’ tours of Italy were more than musical adventures – in keeping with the spirit of the times, they also represented journeys of cultural discovery. The letters are full of references to major cultural attractions visited by the Mozarts, including the Verona amphitheatre (letter 152) and Vesuvius, Pompeii and Herculaneum (letter 191). Leopold was particularly enthusiastic about Istituto delle Scienze at Bologna: ‘All that I`ve seen here surpasses the British Museum, for here there are not only unusual objects from the world of nature but everything that comes under the heading of science, preserved like a lexicon in beautiful rooms and neatly arranged in an orderly fashion: in a word, you`d be amazed etc.’ (letter 171). In order to remember these places, and to show his family and friends in Salzburg what they looked like, he purchase copper engravings of many of them (see letter 186). And he collected numerous souvenirs, including some he described as trivial (such as a piece of the True Cross, see letter 221) but others that he treasured: ‘I shall not only bring back with me all the rare sights in the form of many beautiful copper engravings but have also received from Herr Meuricoffre a fine collection of Vesuvius lava – not the kind of lava that anyone can easily get hold of, but choice pieces with a description of the minerals that they contain. . .’ (letter 190). We also learn from these letters some of the details of everyday life in the eighteenth-century, for example that different pens were suitable for writing music or letters (letter 202) or that in Italy, apparently unlike Salzburg, the best rooms were on the ground floor since they did not get as hot during the summer as rooms on the upper floors (letter 203). And of the vicissitudes of travel: ‘In this [letter] I must praise my sedia, which has successfully survived this journey, and even though we rattled over the biggest stones at breakneck speed on the Venetian roads from Verona and even from Peri, I didn’t feel the least discomfort, although I had to have 2 straps fixed to one of the two front wheels as the incredible heat had completely dried out the wood and it made little or no difference that I kept moistening it with water’ (letter 243). All told, then, the Mozarts’ Italian letters are a window not only on to Mozart’s early career and travels, but also on to the culture of his eighteenth-century world.